Kairoa Brewing, a brewpub inspired by its owner's New Zealand roots, is now open on Park Boulevard in University Heights. 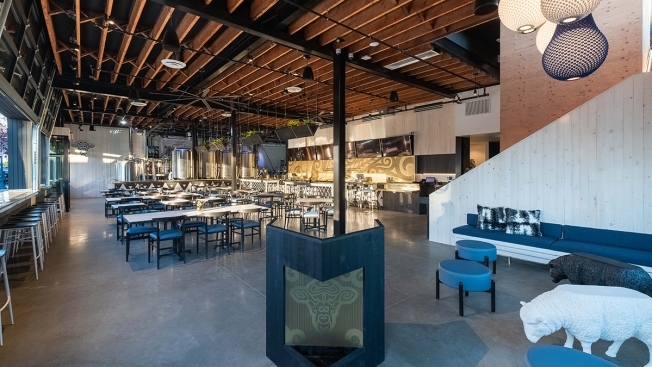 Eater San Diego shares the top stories of the week from San Diego’s food and drink scene, including a peek inside Park Boulevard's new brewery and restaurant inspired by New Zealand. Kairoa Brewing Company brings University Heights its first-ever brewery via a two-level brewpub inspired by the New Zealand heritage of its owner. The house beers feature New Zealand hops while the menu includes Kiwi classics like mussels, sausage rolls, and savory pies. The new spot is located along Park Boulevard, right next to the University Heights neighborhood sign. Beloved dessert destination Extraordinary Desserts will shutter its 30-year-old original location along Fifth Avenue near Balboa Park to open a new outpost in Bankers Hill this March. A modern showcase for the cafe's extravagant cakes and pastries, the new space will also offer beer, wine, and small plates. The new location is about a mile-and-a-half away from the original location. An alum of Old Town's much-admired Sushi Tadokoro is launching his first solo restaurant along Adams Avenue in University Heights. Soichi Sushi will debut next month with a traditional sushi menu and an emphasis on omakase, chef's choice multi-course dinners. North Park's popular barbecue spot expands with a large-scale restaurant and entertainment venue in Flinn Springs in San Diego’s East County. This Grand Ole BBQ location, in the works since last February, will feature the eatery’s signature Central Texas-style smoked meat as well as prime steaks, bar bites, and more. Cocktails, live music, and games round out the offerings. Two professional skateboarders and friends, Riley Hawk – son of local skate legend Tony Hawk – and Shea Cooper are teaming up to launch a coffee and record shop in Oceanside. Steel Mill Coffee will serve drinks made with James Coffee Co. beans as well as pastries and snacks. The shop will also sell new and vintage vinyl records.